The Affordable Care Act aka Obamacare has been a vital path into health insurance coverage for millions of Americans. But the Houston Chronicle and other media deserve credit for reminding that most people in this country still get insured by employers−and Americans are struggling with the social experiment in which ever increasing costs of care get shifted on to them. As the Chronicle story points out, 155 million Americans are covered by employer-based health insurance, versus 11 million in Obamacare exchanges. Citing data from the Kaiser Family Foundation, the Texas news organization points out that this year, for the first time, 51 percent of those who get their health insurance now have deductibles−sums they must cover out of their own pockets first before benefits kick in−of $1,000 or more. 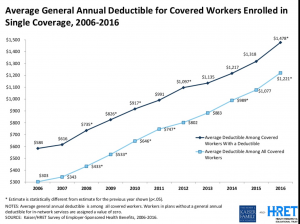 A decade ago, that deductible, on average, was $584. Now it is $1,478. 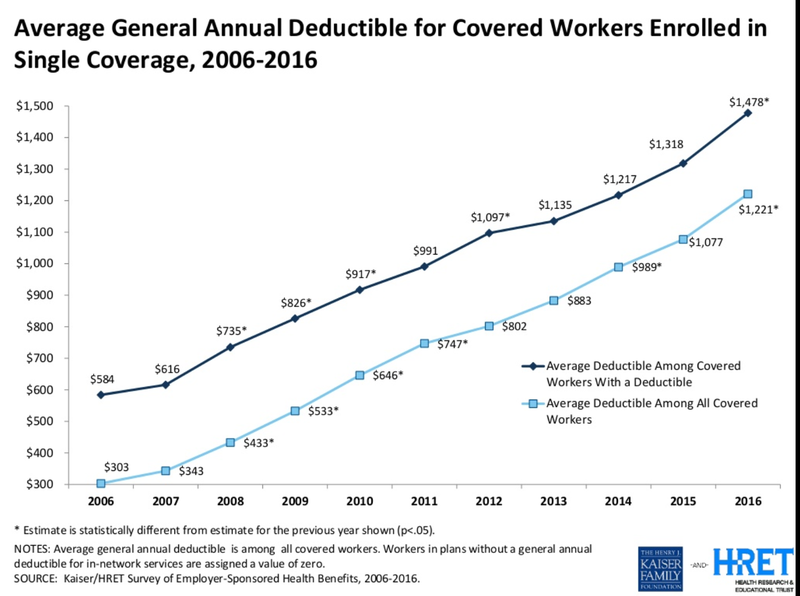 To afford their work-based health insurance, the Chronicle says, more Americans have signed up for high-deductible options. These can lower the monthly premium for workers, and employers have pushed hard because these save companies money. But too many Americans lack basic savings so they can pay bills for medical care to satisfy deductibles. As the Associated Press found in a nationwide poll, most Americans earning up to $100,000 would have a hard time coming up with $1,000 in an emergency. So when it comes to health care, confronted with high deductible policies, many Americans are skipping doctor visits, praying to avoid hospitalization, and postponing medical treatments wherever they can. The newspaper tells the sad story of a middle-class mom who posts on social media, seeking suggestions about the seriousness and need for care of her son and his spreading rash, an apparent reaction to an already costly antibiotic. She resists and resists, but finally decides she has no choice but to figure some financial work-around so the boy can go see the doctor, again. Under the Affordable Care Act, specified preventive care−certain shots, screenings, and office visits−are supposed to be covered. But, as I have said before, Obamacare is imperfect. It needs work by serious-minded, bipartisan leaders−not just the knee-jerk rejection of partisans who simply would cast the poor and the working poor into disease and despair. With health care comprising 18 percent of the gross national product, and with so many Americans, whether covered on the job or with Obamacare, discomfited, politicians and policy-makers can’t keep talking past each other. We need to re-join an important conversation about making our health care better.